* Funeral urn is handcrafted of 100% brass and finished in lacquer with a clear protective coating. * The beautiful silvery flowers are hand-engraved. * Attractive urn will fit well with any decor, particularly on a mantel over a fireplace or in a library. * silver Flowers Urn evokes the memory of your loved one in a traditional and timeless design. * Our urns offer a threaded lid that allows you to safely and securely handle or transport the urn. 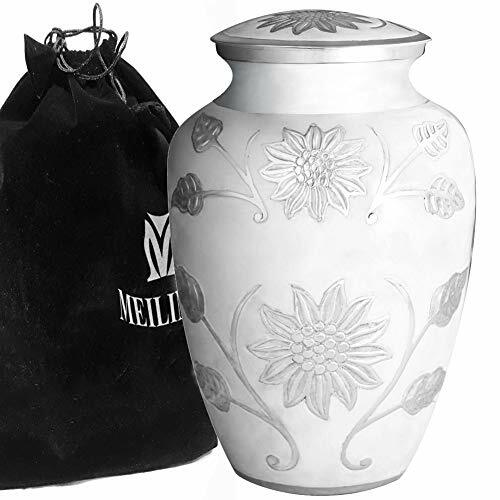 * Meilinxu urns are maintenance free; simply wipe the hand-made brass urn with a clean dry cloth. * The large/adult urn holds up to 200 cubic inches of cremated remains (one pound weight prior to cremation equals 1 cubic inch), and fit the remains of adults weighing up to 200 lbs. * Package Dimensions: 12.2 inches high x 7.5 inches in Width. * We trust that you will be happy with the quality and design of our products. * If you are not happy with the design you selected, please return your unused urn to Amazon for a full credit and select another Meilinxu Urn. When you buy our products, shipped by Amazon FBA, if the shipping fee is expensive, send an email to us, And let us know which style you want. We will tell you another way to buy it, so that you can get a cheaper price. FEATURES:☛ The urn is durable and easy to maintain. This Unique Meaningful The rose sprouted buds central theme memorial will honor your Loved One's existence. To the one you love, A like a continuation of the life of the urn, with high quality urn to hold their ashes and act as a fitting tribute to the love you shared. The threaded screw top securely contains the remains of your loved one, while the felt-covered bottom protects your furniture. QUALITY:☛ Our urns are handcrafted uniquely by an ancient process called sand casting. The Silvery Rose Model look is uniquely hand crafted for each urn to show beautiful detail giving the FUNERAL or at home a unique look to each finished product. Our urn is made of 100% brass. Not matter what the design and the handcraft and price of our Products are all your best choose. VISIT out Amazon store to see our complete collection: https://www.amazon.com/meilinxu or by clicking on "Meilinxu Memorial" link just below the price. We offer a full line of full-sized funeral urns / cremation urns in traditional styles as well as keepsake urns that allow families to share the remains of loved ones. If you have any questions about this product by MEILINXU, contact us by completing and submitting the form below. If you are looking for a specif part number, please include it with your message.